Meet & greet at Auckland Airport. During the following sightseeing tour you will make acquaintance with the "City of Sails", as Auckland is often called. We drive to the extinct volcanic cone of Mt Eden, from where you have a beautiful view over the city. We continue to the elegant suburb of Parnell and to Auckland Harbour. 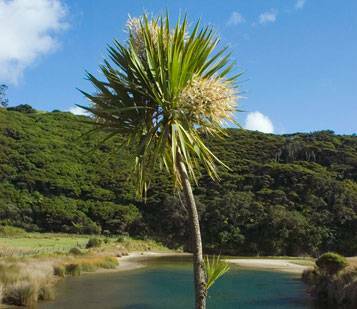 You'll also enjoy a half day visiting the vineyards and wineries of West Auckland. These vineyards have been established originally by immigrants from Europe to make wines for New Zealand’s largest city. The Chardonnay, Sauvignon Blanc and Chenin Blanc wines are noticeably different in flavour from more southerly areas and the region produces stylish reds - Cabernet Sauvignon or blended with Merlot and Cabernet Franc. Our first visit will be at Matua Valley Wines, where lunch can be taken at The Hunting Lodge (optional, group bookings essential). 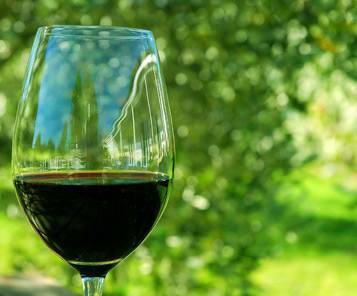 Here we will find an impressive sales cellar, petanque, croquet and picnic facilities in an attractive garden setting, Auckland’s best winery restaurant and of course, excellent wines. Our second vineyard visit for today is at Coopers Creek, which claims to have won more medals and trophies than any small to medium sized winery since 1989! After travelling back to Auckland, you have the option to enjoy a dinner of excellent New Zealand cuisine. Alternatively, enjoy dinner at a top seafood restaurant in Auckland or at the new Orbit Restaurant in the Skytower (optional). After breakfast, we travel to the Bay of Plenty. On the way to Tauranga, we travel through the Waikato and stop for a vineyard visit at Rongopai Wines, where botrytised dessert wines are made. Around midday, we reach Tauranga in the Bay of Plenty. We have optional lunch at Mills Reef Winery's very attractive restaurant. The developed winery is a spectacular piece of Art Deco design, complete with a sweeping driveway and palm trees. In the late afternoon we reach Rotorua. 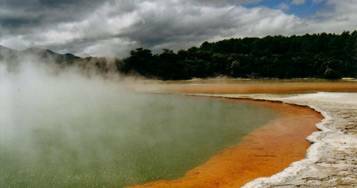 The first thing you will notice in Rotorua is the omnipresent smell of Sulfur that escapes through many cracks in the underground. Here the Geysers are awaiting you, steaming pools and brooks, blubbering mud holes and hot mineral pools. We explore the Whakarewarewa thermal area and visit a Maori village in the city centre before we check in to our hotel. Rotorua is one of New Zealand's centres of Maori culture. At night we participate in a Hangi, a traditional Maori meal cooked under the ground. After the feast, the Maori performers sing, play and dance, including everyone in their lively musical culture. Experience the challenge of the famous Maori Haka. The skill of the participants is tested in Maori stick games. See the swinging of the poi, symbolising the flight of the bird. All actions, games and dances are accompanied by harmonious singing. After breakfast we travel towards the wine region of the Hawke’s Bay for a day enjoying wine. Tour selected wineries on the Heretaunga Plains. Taste and purchase award-winning wines. This region is at the forefront of New Zealand’s wine industry, exploring new varieties, producing a greater range of high quality wines and extending the New Zealand wine experience. Try some of the Cabernet Sauvignon, Chardonnays, and Riesling wines the region is particularly well known for. We will visit three-four vineyards in the region. We suggest a visit at Alpha Domus, Esk Valley Estate, Cross Roads Winery and Corbans Hawke’s Bay Winery. If time allows, we suggest a visit of NZ’s first major winemaking museum, which puts McDonald Winery high on the must-visit list. Housed in underground storage vats, the exhibits recreate winemaking conditions as they existed at the turn of the century. End the day with dinner at one of the excellent winery restaurants (optional). Today we travel towards Wellington via Martinborough. En route, enjoy wine tasting and lunch (optional) at a Wairarapa winery. We suggest a lunch at Gladstone Vineyard, established 11 years ago. The Gladstone Platter is the specialty and features local products including award-winning cheeses. If time allows we visit another two-three vineyards in the Wairarapa region. In the early evening we arrive in Wellington. The capital boasts a veritable smorgasbord of restaurants, with more restaurants per head of population than New York. The city has the widest range of international cuisine to be found anywhere in the country. Another day in Wellington for your own leisure. After breakfast, transfer to the airport for your flight to Queenstown (flight cost not included). Central Otago is NZ’s fastest growing wine region and its reputation has been built on Pint Noir. 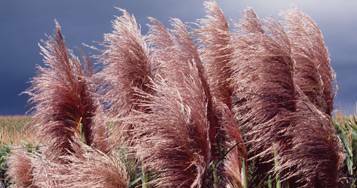 Wines from the unique cool, continental climate provide styles that are distinctively different from those of other NZ regions. Queenstown was the site of the largest goldrush in the country back in the 1860's, and now it has an international reputation as the adventure capital of the world. The combination of a unique alpine setting located next to a freshwater lake, a range of 75 different activities and attractions for visitors to experience and a compact town centre covering just one square kilomtre are just some of Queenstown features. Dubbed as the “adventure capital of the world”, young and old flock to Queenstown to experience its famous bungy jumps, white water rafting, tandem parapenting, hang gliding and jet boating. The day today is at your own leisure to explore some of these attractions. We visit Felon Road Wines, which boasts a very smart and efficient winery, that has produced some of the country’s more exciting wines. If time allows, we visit Olssen’s Garden Vineyard which is more than a wine producer - it is a destination. Around midday we approach Queenstown and visit Gibbston Valley Wines for an optional lunch. This vineyard was the first commercial winery in Central Otago and remains the area’s largest winery. It also has the highest profile and must certainly attract the most visitors, thanks not only to its sizable wine production, but also to a very popular restaurant and an impressive 70-metre cave tunnelled into the rock hillside. After lunch we will visit Arrowtown, the former Goldmining township and discover how the settlers in New Zealand lived in the days of the Goldrush. sheep farming is still the predominate method of farming, the wide diversity includes dairy, beef and deer farming. We reach Dunedin at early afternoon. Dunedin is the main centre of Otago, a region recognised for its spectacular scenery. The sheer physical beauty of Dunedin - dramatic bush covered hills and valleys at the head of a long natural harbour - attracted Maori settlers to the site over four centuries ago. Dunedin’s composition is a blend of history and modernity, possessing a unique combination of cultural riches, fine architecture, and world-famous wildlife reserves. 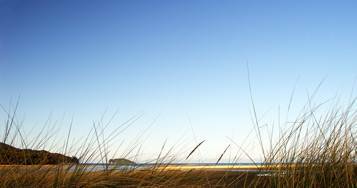 We will take you on a brief sightseeing tour before we travel to Otago Peninsula. This peninsula has internationally renowned wildlife reserves including the Royal Albatross breeding colony and rare Yellow-eyed Penguin colonies which we visit in the later afternoon. You will be taken on a guided tour at the Albatross reserve and travel further to the Penguin reserve, where you will get close-up views to the nests without disturbing these animals. In the evening we return to Dunedin and check in at the hotel. 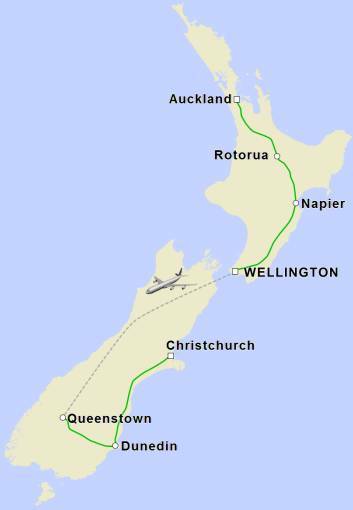 Today we travel along the East Coast towards Christchurch. 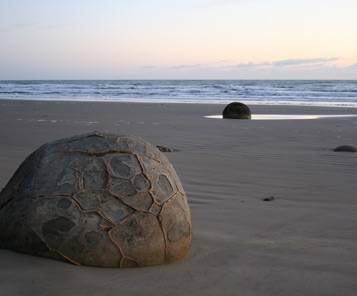 We stop at the Moeraki boulders, curious rock formations lying on the beach. We pass several small farm towns and have a lunch break at a farm in Ashburton, where the farmers invite you for a farm tour. Experience a sheep shearing demonstration on a working farm and share a home-made lunch with the farmer family. We reach Christchurch in the afternoon. The rest of the day is yours to punt on the Avon River, to visit the cafes or just to relax in the hotel. Another day in Christchurch for your own leisure. After breakfast we visit the International Antarctic Centre, which provides visitors with an impression of this icy continent and our human activities there using full-scale models. At midday, we transfer you to the Christchurch Airport, from where you start your flight back home. 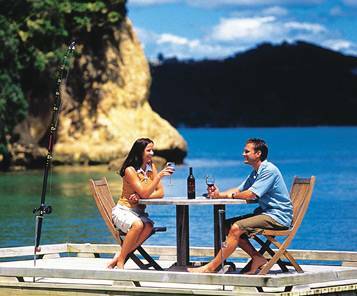 New Zealand’s abundance of fresh meats, seafood, vegetables, fruits and cheeses along with wines, all produced in our clean and natural environment, make New Zealand a gourmet’s paradise.